My life revolves around two things: the people I love and the written word. I can picture my life being different had I lived somewhere else or worked different jobs, but the thought of being without those people and without the ability to read and write is unimaginable. It isn’t just a question of what would my life be like; it’s a question of who would I be. Two of the most special moments of each day for me are the many times I sit and read to my daughters and late at night when I sit with my own thoughts and write my own words. For 774 million people around the world, these moments are not possible. There are 774 million people who cannot read and write. 774 million for whom information is limited to what they can see and what they are told. 774 million whose thoughts and ideas go unrecorded save for some assistance. 774 million whose universe is constrained by their inability to see beyond the horizon through the written word. 774 million people who have never been able to take that journey that a good book makes possible. Knowledge truly is power and knowledge coupled with imagination is unstoppable. Knowledge is so often contained in the written word, requiring literacy to unlock it, and imagination both can be born of and give birth to the written word. Global liberation requires global literacy first. Until global literacy can become a reality, these millions will remain marginalized, their political might co-opted. My girls and I will be participating in World Read Aloud Day. We hope you will, too. 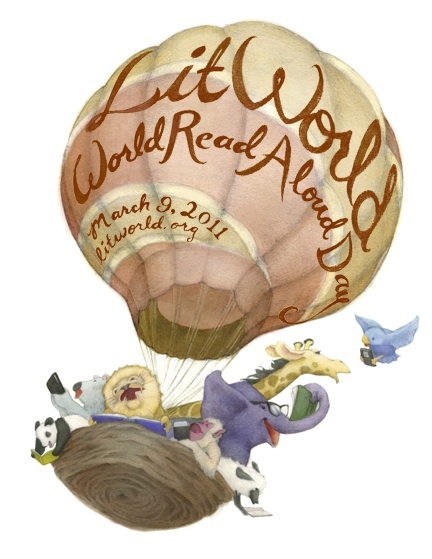 Here’s how you can help and here are some great activities for World Read Aloud Day. Thanks to LitWorld, with a nod to Mr. Chris Singer of BookDads.com, for being advocates for all of our futures. This entry was posted in Uncategorized and tagged books, literacy, LitWorld, World Read Aloud Day. Bookmark the permalink. Thanks for sharing this with your readers. Great connecting with you my friend!! Thanks for doing all that you do, Chris. You will most certainly be leaving this planet better than you found it. It’s been a pleasure connecting with you, too. Blessed are we with the written word. Indeed. It is more important than most of us realize. We must keep it so important. Thanks, Mitchell. That number is staggering. Thanks for sharing this! Thanks for reading (no pun intended, but I’ll take it).